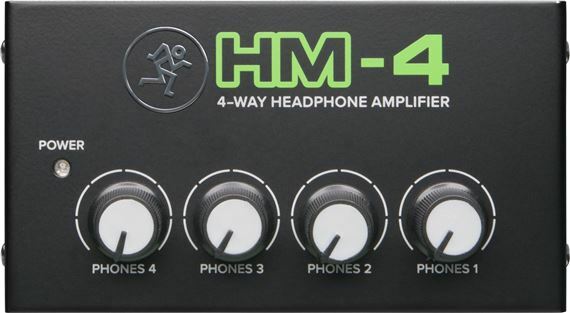 Order your Mackie HM-4 4 Way Headphone Amplifier from AMS and enjoy Fast & Free Shipping. Get the Best Deal with our Lowest Price Guarantee & Great Customer Service! Straightforward and incredibly easy-to-use, the ultra-compact HM-4 4-Way Headphone Amplifier by Mackie is truly the no-hassle headphone management solution! The HM-4 features a single 1/4” stereo input and four 1/4" headphone outputs, each with their own individual level control. That makes the HM-4 ideal for studio use, band rehearsals, and even personal listening when up to four people want to listen together. Mackie products are Built-Like-A-Tank™ and this incredibly budget-friendly performance headphone amplifier is no exception! Includes 12v AC power adapter. Reasonable price and works great! Does what I needed for my home studio. I found myself in a pinch a couple of times while recording podcasts. I simply didn't have enough headphone outputs. That is no longer an issue that I have to worry about. This was a small investment that as served me very well. It's size makes it great for portable setups allowing us to podcast live or record in any environment without having to worry about how many guests will be able to hear themselves. The power adapter is shaped properly as not to take up too much valuable real estate on your power strip. And lastly the controls are clearly labeled taking the guesswork out of the equation so any of our guests that happen to be less technically savvy feel less intimidated adjusting their own volume. Came today and its defective. As with all of Makie’s products, this thing is built like a tank. It’s small size is perfect too. I bought this to integrate more headphone sends into my portable recording rig. It fits into my laptop case and takes up a minimal space in the desk or console that I set up on. Clean and useable power that is just as described and expected.